Colbert, M.D., Don. Let Food Be Your Medicine: Dietary Changes Proven To Prevent Or Reverse Disease. Franklin, TN: Worthy Publishing. 2016. Struggling with his own illness, Dr. Don Colbert thought outside the box to overcome it. 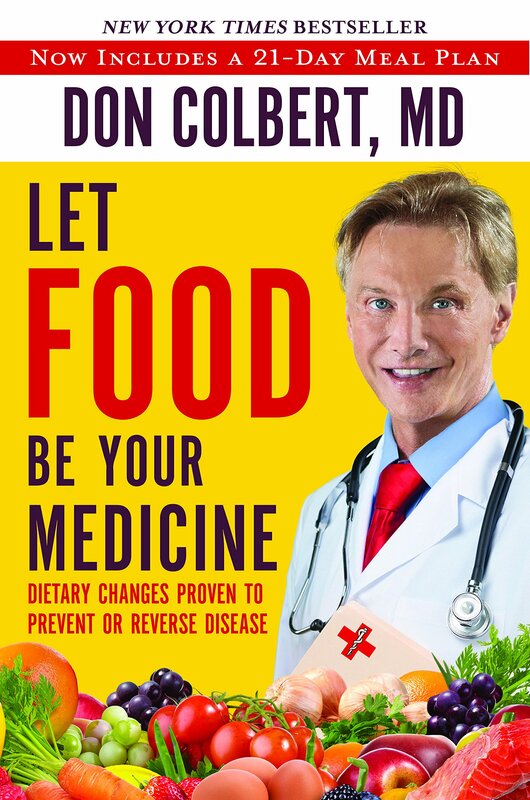 Sharing his methods, and hopefully the same positive results, his updated version of his book, Let Food Be Your Medicine, is about making changes to live a healthy lifestyle which both treats and prevents diseases. With a section on information to help make the best choices regarding inflammation, weight loss, and proper nutrition, it also includes a section on specific illnesses such as cardiovascular disease, arthritis, autoimmune, diabetes, cancer, dementia and mental illness. Concluding with appendixes on a 21-day meal plan, shopping lists, material on pesticides and mercury, as well as supplements, the material is very well organized and easily useable. As I’ve already made several of the healthy lifestyle changes suggested, this newly updated version now supplies a 21 day meal plan which follows the modified Mediterranean Diet as a suggested starting point. With clear evidence of the positive effects of the Dash Diet and Mediterranean Diet, this book enhances those diets with healthy choices for food, exercise, awareness and faith. Full of really helpful information with specific illnesses and challenges organized by chapters, it provides nutritious menus, foods to avoid, and personal stories that may change your life for the better. As a New York Times best-selling author specializing in anti-aging medicine, Dr. Don Colbert has impacted many through his research and walk with God. This entry was posted in Christian Books, Healthy Lifestyle and tagged Christian, Christian Author, Christian Book Review, Christian Contemporary, Christian Non-fiction, Diseases, Food, Illnesses, Inspirational, Nutrition, Recipes by Savurbks. Bookmark the permalink.